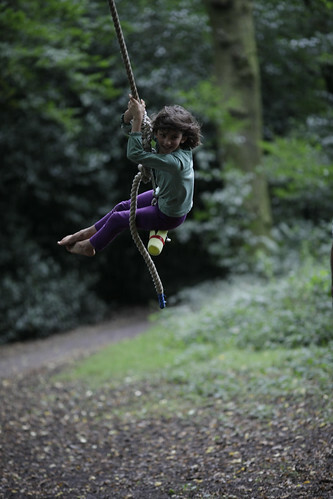 In 2010 we were approached by the charity London Play to help write a good practice guide to installing rope swings in trees. Despite their popularity and obvious play value, the lack of any kind of industry standards or guidance had deterred play professionals from using tree swings in their practice. Inspired by the Forestry Commission's excellent decision-tree for their rangers regarding tree swings, we drew on multiple sources of expertise to pull together this good practice guidance document. The guidance covers all of the the issues around supervised play on tree swings installed on a temporary basis and removed at the end of the session. You can download a free pdf of the guide below. We have run a number of tree swing seminars for outdoor playworkers and rangers since publishing the guidance. Please do get in touch if you would like us to organise some training for your staff. Islington Council like tree swings so much that they asked us to trial a semi-permanent installation in Whittington Park, N19, in late 2011. The trial was a success, and we learned some interesting lessons about the issues involved - see here for more. Please contact us if you are considering installing a tree swing on your site on a semi-permanent basis. ADDENDUM: People often ask us about the risks posed by Summer Branch Drop in relation to tree swings, so our resident arb consultant Ben Rose has written up a briefing note on the subject which you can also download below. Islington Council's trial rope swing in a London Plane tree in Whittington Park in Archway. Islington Council's Greenspace team like tree swings so much that they asked us to trial a semi-permanent installation in Whittington Park, N19, in late 2011. The trial was a success, and we learned some interesting lessons about the issues involved. You can download the case study below. The tree swing is now (as of April 26th 2012) back up again, in an Ash tree nearer to the park-keepers office, which should hopefully deter dog owners from encouraging their dogs to chew on it!